Established in 1991, Capital Cruises is the original and largest all-electric boat fleet on the Highland Lakes. Nestled on the shores of beautiful Lady Bird Lake (formerly Town Lake) at the Hyatt Regency Hotel (208 Barton Springs Rd., Austin, TX), we are proud to offer lunch and dinner cruises, wedding events, internationally famous bat-watching excursions, party boat services and the ultimate alternative for group and corporate outings. As the first company to offer a tour to see the emergence of the now famous Congress Avenue bat colony, Capital Cruises has long been the best choice by which to take the renowned Sunset Bat-Watching Cruise. At just $10 per adult, $8 per senior (60+), and $5 per child (12 and under who require a seat), the Bat Cruise is the ideal choice for the whole family. Reservations are advised, as we sell out nearly every night, and they can be made either online or via phone. Possessing the most diverse fleet in the area, Capital Cruises is the only company in town through which you could host a dinner cruise for groups as few as two, and as many as 140 people. With catering provided through the Four-Diamond Hyatt Regency Hotel, we are able to provide a high-quality product while maintaining entirely competitive and almost entirely lower pricing. Conveniently located in the heart of Downtown Austin, Capital Cruises provides the perfect choice for the outside-the-box corporate event, wedding event or private party. We have a number of options for the more adventurous customer, including rentals of canoes, kayaks, paddleboards, as well as one of the most popular photo opportunities in town: the swan pedal boat. With no gas-powered traffic to contend with on Lady Bird Lake, it is both safe and fun for manually powered recreational vessels. 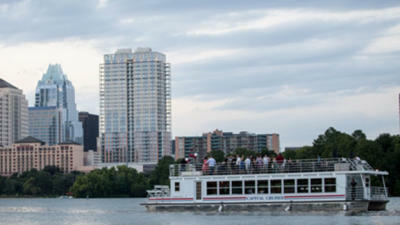 Open year round, Capital Cruises provides lake excursions for all types of events and is the ultimate Austin Experience!